Just like with any exercise program, you are asked to take a before picture of what you look like so that you can see your progress throughout the program. I want you to take a picture of where you are today (your before) so that you too can track your progress over the next 90-days of prayer. Now, I don’t want you to take a literal physical photo, but I want you to take inventory (a snapshot) of who and where you are as of today. Over the next 90-days, God is literally going to transform you from the inside out in the areas of your mind (thoughts/spoken words), heart (emotions/feelings), hands (work/obedience), & your feet (walk/destiny). 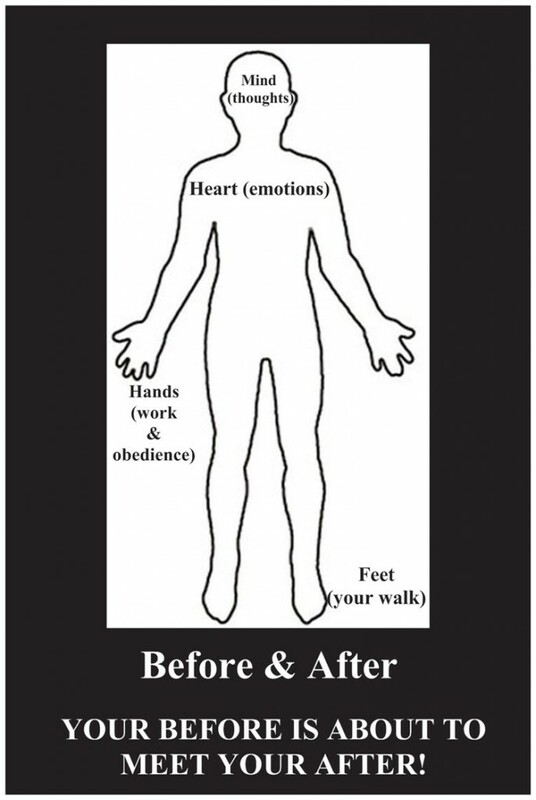 If you are starting the process of Prayer for 90-Days and the before picture of your life is depressed, suffering from brokenness, sick, weak, in financial ruin, fearful, confused, lonely, sad, lacking faith, unmotivated, stuck, etc… then when you finish the 90-days of prayer (the after picture of your life), you will be strong, happy, joyous, healed, set-free, blessed, wealthy, walking in wisdom, powerful, courageous, etc..
God is Perfecting You! Perfect means to bring to completion, to finish, to bring to perfection, and to make flawless or faultless. To perfect the defects or shortcomings, to improve and make fully skilled, and to make one pure. What you are experiencing now is the perfecting process of God. He is bringing you to completion. You are experiencing the birthing of who you really are. God used trouble to bring out the best in you. He used pain to bring out the purpose in you. He is using sufferings to bring out the success that is within you! The perfecting process does not feel good, but once finished, it sure does look good. YOUR BEFORE IS ABOUT TO MEET YOUR AFTER! Kick-off Prophecy Pt.2 Click & Listen to this Powerful Word! I love to define words; I just simply love to know the meaning to everything. 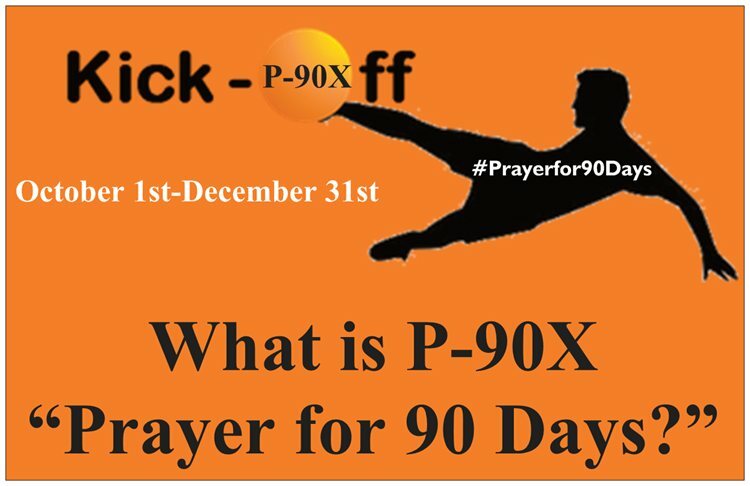 So, when God placed it upon my heart to pray and intercede for 90-Days and call it P-90X, I just had to know the meaning of 90 and X. The “P” stands for Prayer! Of course, when we pray over the course of the next 90-Days, we will experience, peace, praise, perfection, process, promotion, pain, purpose, prosperity, perspective, patience, perseverance, and so much more! The Number 90 is the number of completion of all cycles; 90 is the complete cycle of growth, the period of time in which the spiritual cycle is completed. It is the number of attainment and fulfillment. The Biblical numerology and symbolism of the number 90 is the number of judgment and order that leads to righteousness. It also means divine completeness from the Father. The number 90 is a number of Patience. It is patience of harmony, meditation, inspiration, and perfection of ideas. The number 90 is also associated with silver, platinum, pearl, and diamonds; it is a wealthy &amp; prosperous number. The flowers associated with this number are white roses, white carnations, and lily of the valley; it is a number of peace, purity, and holiness. The number 90 is also a symbol of creation and represents that life is full of development and rhythm. It is a number of Power! It is the number of those who accomplish the divine will. It means Harvest! Over the next 90-Days, I want you to receive spiritual wholeness, righteousness, purity, holiness, order, clarity, wealth, completion, accomplishment, growth, patience, harmony, peace, inspiration, perfect ideas, development, fulfillment, power, and God’s divine will &amp; your harvest! The number 90 is defined as an unitary perfect number. There are only five (5) numbers that are unitary perfect numbers and 90 is one of them. Unitary is defined as something pertaining to a unit or units, which are characterized by, or aiming toward unity. It is something that has indivisible character of a unit. It is something that is whole. It is a measurement or estimation of something. It is something that can be used! During these next 90-days, you will see your life coming together in unity. You will begin to feel and live completely whole again. You will no longer be a divided individual, but you will continue to exist for the purpose of being a whole unit &amp; a whole person. The number 90 is perfect, meaning it is complete. You too will experience perfection and completeness over the next 90-days in your life. You will be indivisible over the next 90-days, you will become incapable of be divided &amp; separated from God, your purpose, and your destiny. You will no longer live a divided, depressed, and confused life. You are someone that can and will be used by God to do great and mighty things! Think of this powerful number 90 in reference to a Square Box. 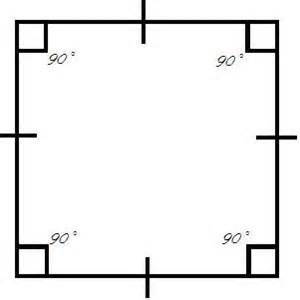 In a normal space, the interior angles of a square measures 90 degrees each. Thus, an angle measuring 90 degrees is called a right angle. Over the course of the next 90-Days we are going to make some right angles, we are going to have some things in our lives finally add up to what and where they should be. We will no longer walk around lopsided, unequal, and off balance as it relates to our life’s purpose &amp; destiny. P-90X “Prayer for 90Days” is your right angle to get everything in your life moving in the right direction! The number 90 as it relates to time and dates in the Gregorian calendar is symbolized as XC! I believe this is to mean Xtreme Christian. We need some XC’s in the world today, some Xtreme Christians. I believe when we pray and intercede for the next 90-days that we will not only be transformed into an XC (an Xtreme Christian), but we will also Create an Xtreme Christina Culture! X is powerful because it is a letter &amp; a number. You are more than what you think you are and what people can truly see right now. You are not limited to one thing, but you are multi-talented and your purpose will touch a multitude of people! It is time to have Xtreme Prayer for 90-Days… because seriously praying for 90 days straight is intense, extreme, and people will be transformed! A Son of Promise Prophesied at 90! Due Date is December 31, 2013! Sarah experienced being Pregnant at 90, going through Pregnancy at 90, &amp; Birthing at 90. You too over the next 90-Days will hear the good news of being spiritually Pregnant, going through Pregnancy, and Giving Birth at 90! Congratulations! You are Pregnant! This is an exciting time for you. Many of you like Sarah thought that God had forgotten about you and that it was too late, that you would never be able to conceive from God. I want you to know that you are not only pregnant with a seed, but a supernatural seed from God. What God has placed on the inside of you will revolutionize this world. Don’t just be satisfied with the news of being pregnant, but be determined to not miscarry in the spirit and go through your entire pregnancy with the expectation of delivery! Pregnancy: Being pregnant in the natural is not easy, and it is not easy in the spirit either. Just like in the natural, you too in the spirit will sometimes experience morning sickness that lasts all day, nausea, being stretched, pains, hurts, emotional ups &amp; downs, weight gain, tiredness, fatigue, and so much more. Delivery: Don’t just stop at getting pregnant, or being pregnant, but focus yourself to deliver and birth-out everything that God has placed on the inside of you! Pregnant: To Conceive! Pregnancy: To Develop! Birthing: To Deliver! “As a woman with child is in pain and cries out in her pangs, When she draws near the time of her delivery, So have we been in Your sight, O Lord… We have been with child, we have been in pain; We have, as it were, brought forth wind” (Isaiah 26:17-18). In order to deliver, you are going to have to experience contractions and you are going to have to Push! 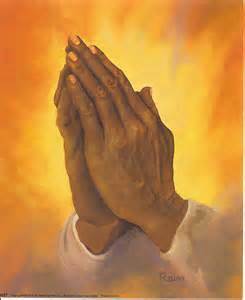 Prayer is your Pitocin. Pitocin is the drug used to Induce Labor! Over the next 90-days, your prayers will be the Pitocin you need in order to go into labor and give birth to your destiny &amp; purpose. Greatness cannot remain inside, but it must be Unleashed! Praying for 90-days is going to cause you to push pass everything that would normally distract you, discourage you, and defeat you. Get ready to have an amazing pregnancy that will bring forth a delivery of blessings, wisdom, peace, destiny, purpose, kingdom access, unity, restoration, new beginnings, and exceedingly above and beyond what you can think or ask! Pregnant at 90 and Delivering at 90! 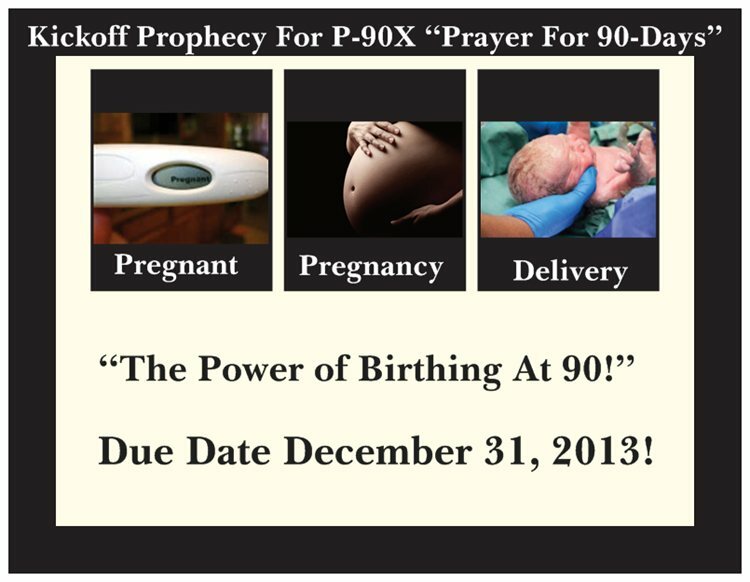 Let’s Give Birth in 90 Days of Prayer! “Recognize with grateful hearts the Father’s blessing toward us in 2013 (The Year of Deliverance) and Receive a fresh fire of His Holy Spirit for the harvesting of souls. 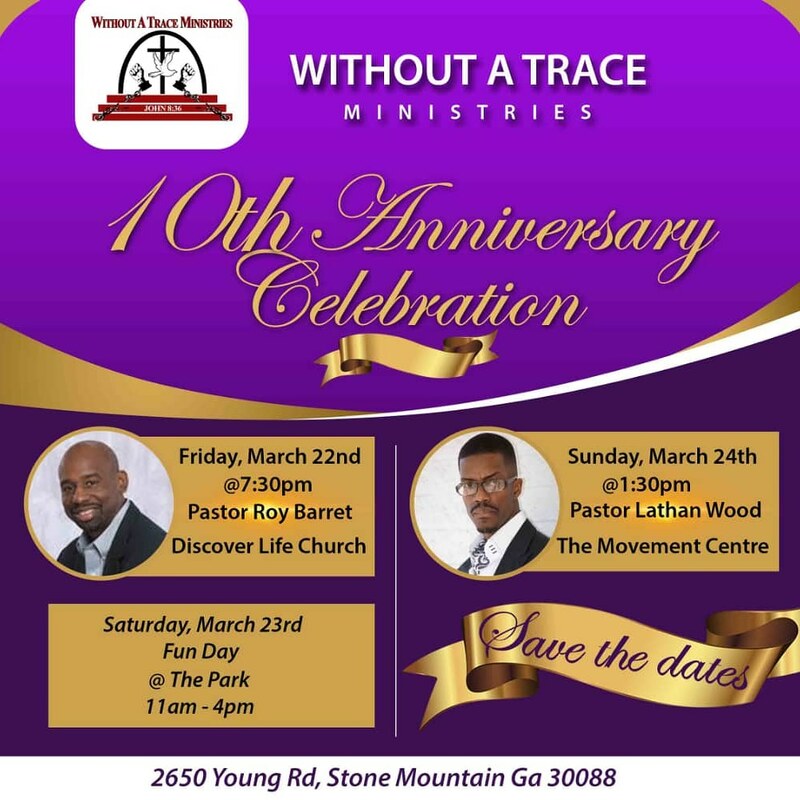 Without A Trace Ministries is partnering with Lifted Hands Ministries in support of one of their January “Random 50” projects. WE NEED YOU! 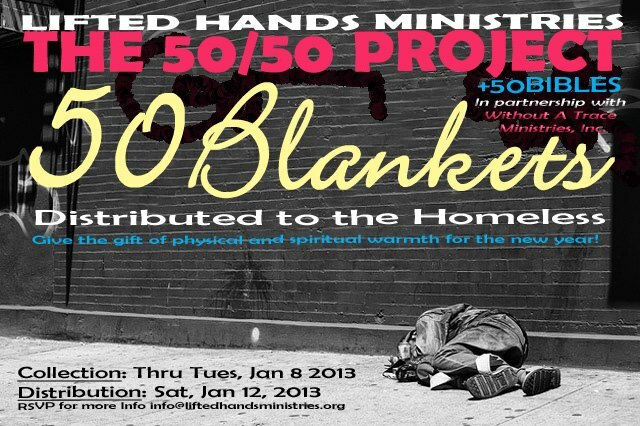 Please join us in gathering at least 50 blankets and bibles (new/slightly used only please) to distribute to the homeless by January 8, 2013. Drop off at Without A Trace Ministries location or donate $5 online specify Blankets & Bibles Project. Pastor’s Gary & Tina McCrea stopped by The Gospel Touch Show to share. 2012 – The Outstanding Year! Jan 1, 2012 // by admin // Blog // Comments Off on 2012 – The Outstanding Year! I love the sport of boxing. While watching the sport, I do not want to see anyone destroyed to the point of no return but let’s face it, you and I both want to see a KNOCK OUT. Otherwise it would not be a good fight would it? Would it? I’ve seen matches where the two opponents were still standing at the end and they both say, “It was a good fight!” Why is that the case? Well, each person was able to fight their way through each round, they learned strategies from their opponent that will be carried over into future fights, and they finished the course of the fight on their feet. In 2012, Don’t allow remorse and regret of 2011 to stand in the way of an OUTSTANDING year. This new year 2012 shall be for those who have kept the faith (steadfastly trusting in God, good stewards of the gospel of Jesus Christ, honoring God’s rules of engagement, and maintaining a lifestyle of fidelity to God), a time to experience the love and fellowship of the Father. 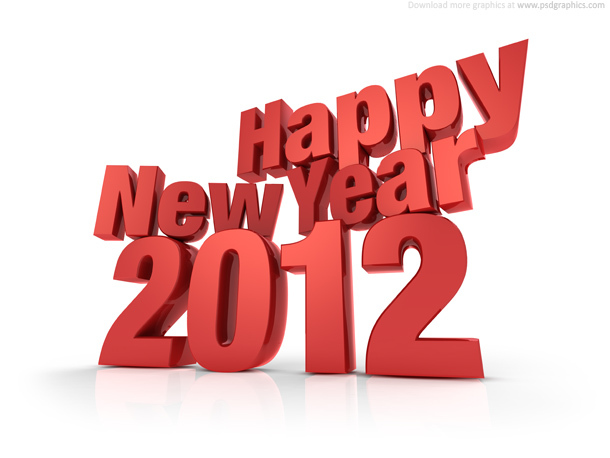 The year 2012 will reveal the Divine Order of God’s governmental rule. The shaking in 2011 was only the making of your foundation in 2012. With this solid foundation under the authority and rule of God, you are empowered to explore and expand. It’s going to be an OUTSTANDING NEW YEAR! So what if you haven’t “Kept the Faith” but you love God or want to know God for the first time? Don’t make shameful excuses like some fighters do when they lose a match. Repent! Turn away from whatever caused you not to stay on your God assigned course (carnality, fantasies of who you want people to believe you are) and ask the Lord Jesus Christ forgive you and to help you to return to righteousness and truth. Forgiveness is so easy when it come from Christ. Just take it honey and take off to a new spiritual focus, peace and empowerment. This step of faith will make 2012 an OUTSTANDING year for you too!